The first class at Martial Sports is free. There are no levels per se, just suggested age groups: 3-6, 4-8, 7-12. Drop by anytime, you’re told. If your kids like their first tae kwon do class, they leave with a brand new white belt and a stripe (Duck tape in a choice of colors). You earn one stripe after each class for effort. You must also earn three silver stripes for respect and one gold stripe for listening. Two of the respect stripes and the listening stripe must be earned at home and are awarded at the parents’ discretion. 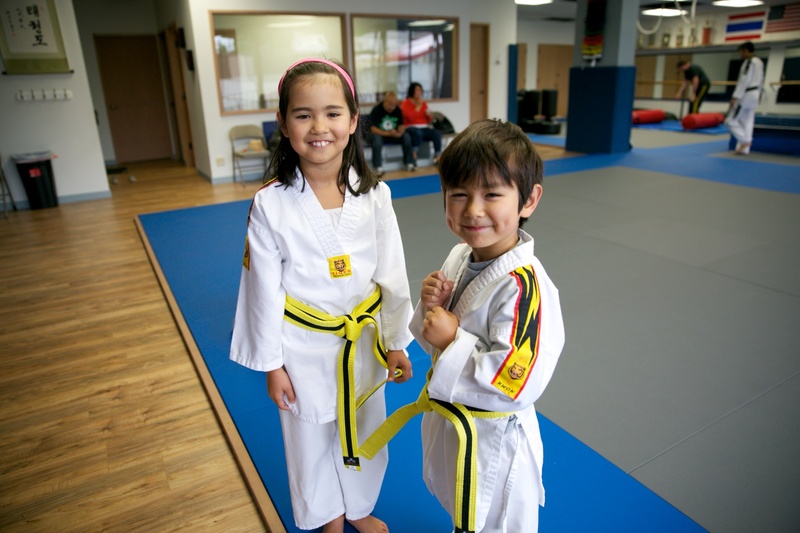 If a student has a sibling, then he or she must earn a sibling stripe, also at the parents’ discretion. Meilee and Shen have been going to Martial Sports once a week for the past year. We have not tried any other schools, so I don’t have perspective on how Martial Sports compares to others. But, to me, it is an endearing place where instructors Master Purcell (owner) and Master Thammarat clearly have a gift for engaging children. The structure of the classes is counterintuitive, because they are not organized by skill level. Classifying students by age group keeps them mostly among their peers based on physical size and social maturity. I didn’t understand how the white belt beginners could be in the same class as higher belts. But once Meilee and Shen attended a couple classes, it became clear just how brilliant this system is. Meilee gets some air while practicing a kick. This is from the beginning weeks of tae kwon do. Master Purcell was using the pool noodle to help the kids practice their reflex skills. The class starts with a few laps around the studio and warm-up stretches. Next, the kids do drills of basic techniques. Then, the instructors set up an obstacle course using cones, paddles, shields, punching bags, mats. 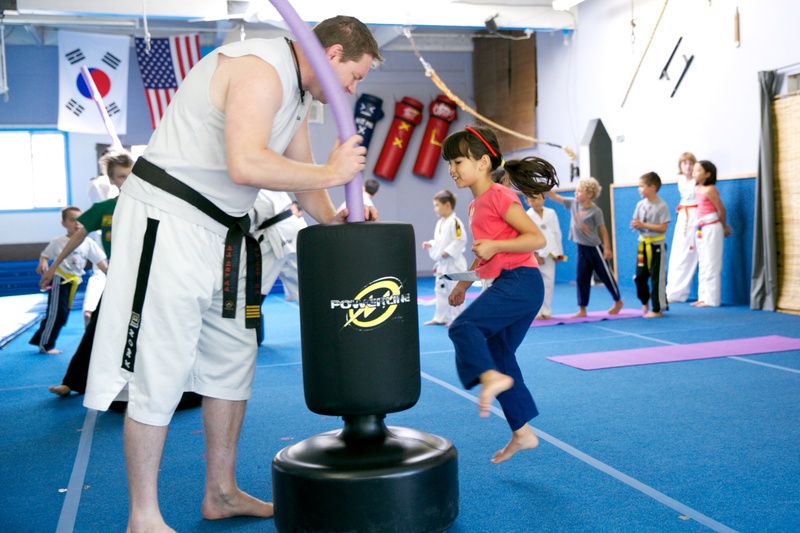 The obstacle course combines different kicking, punching, balancing, agility and strength skills, and also tests listening capability and stamina. 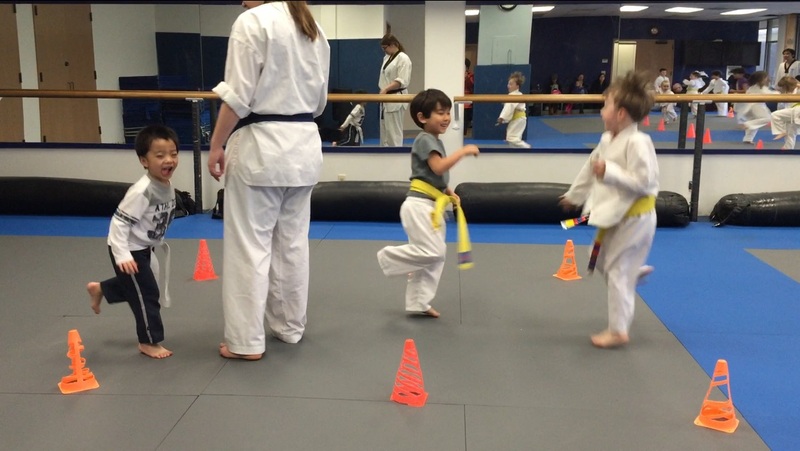 It’s more about fitness and fun than strict technique – though there’s a bit of a Mr. Miyagi (Karate Kid) vibe with the practicing of movement drills such as hopping on one foot and spinning from one orange cone to another and back. Any student can do the obstacle course. The more advanced students certainly have better form when doing the kicks and punches, but the course itself does not require a minimum skill level. The beginners do their best and watch the more advanced students. The advanced students understand they have to set an example. In any given class, there is a mix of personalities, maturity levels, and skill. Some kids always do the opposite of what they’re told. Others put in half an effort. Some goof off and get called out by the instructor. There are, of course, kids who participate enthusiastically and without getting warnings from the instructors. 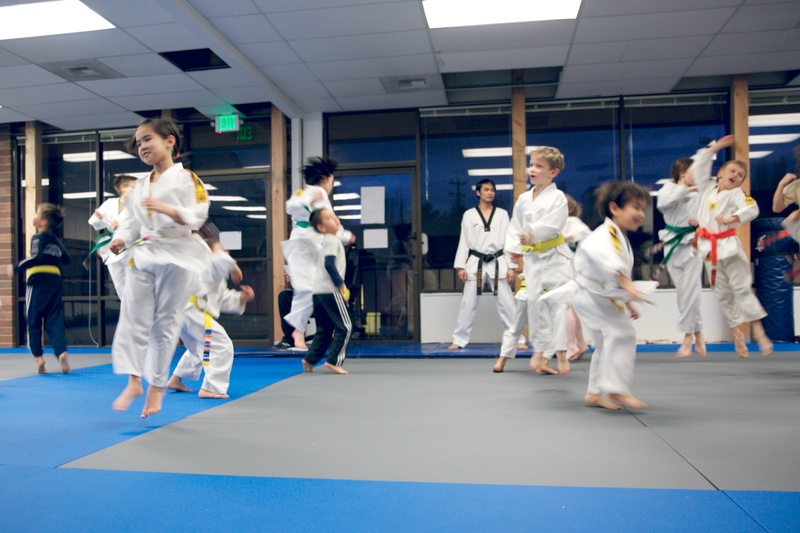 In so many ways, tae kwon do class is a microcosm of society. Each child is at a different place in life, but they all participate in the same activity and they all progress. They compete with themselves, not one another, to improve their skills and work toward the next belt level. And yet seeing the advanced students inspires the beginners to strive. Because there is an age range and families can attend whatever class works for their schedule in a given week, the class dynamic constantly shifts and the kids have to figure out how to adapt. There is much chaos, but it all works. Even amidst the flurry of loud kihaps (yell), chattering parents, and constant motion, there is structure and the kids all seem to be keyed in. Kids learn by doing: Students can start anytime. They jump in an age-appropriate class and start doing the drills. Through repetition, they refine their form. And they do indeed progress. There’s nothing to worry about. Dogma doesn’t work with kids: Master Purcell doesn’t drill the kids with philosophy. 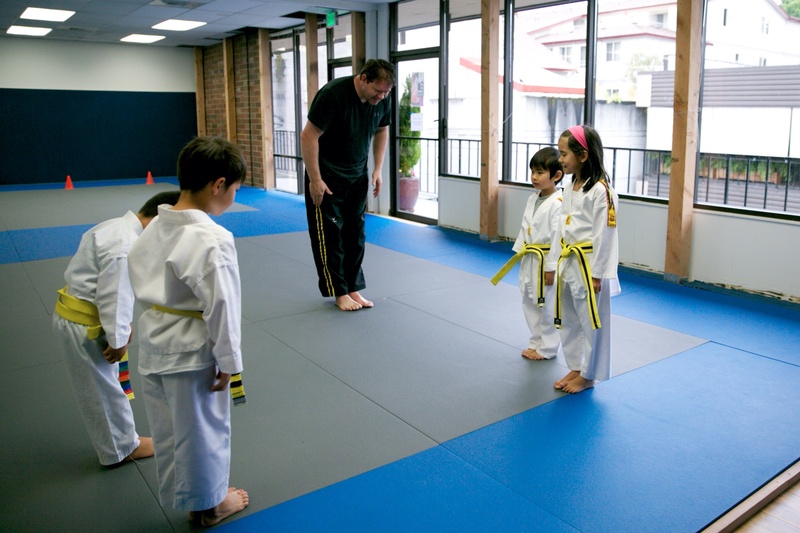 There are general rules of respect – bowing at the beginning of class and before stepping on or off the mat, bowing to honor students who have just graduated to the next belt level, and listening to instructions, for example – but he’s not dogmatic about the ways of tae kwon do. These kids are still kids and they’re all still developing skills as human beings. Master Purcell and other students honor Meilee and Shen after they received their high yellow belts. Hierarchy works both ways: When the kids line up for class, they line up in descending belt order. It is a show of respect for the more advanced students. But when the class breaks for a drink of water, the lower belts get to line up a the water fountain first. Loud kihaps helps you find your voice: Kihaps are the yells that students make when performing a move. Translated, it means “spirited yell” and “focused energy.” New students tend to be shy about yelling “ha!” or “hya!” but when they feel comfortable after a few classes, the kihap becomes second nature. When my kids began kihapping with all their force, it was the sweetest sound. I know they are on their way to being able to speak up for themselves. Four Rules of Self Defense: Master Purcell speaks of these rules to the kids in the context of confronting a playground bully. The difference between fighting and self defense is that the object of self defense is to make the other person stop. The objective of fighting is to hurt the other person. Tae kwon do is about self defense. Use your words. If you find yourself in a potential conflict, try talking it out. If words don’t work, walk away. Don’t run away. If you run, it triggers a chase. If the other person strikes you, use your blocking techniques and yell “stop it.” “Words can be a weapon.” If you yell loudly, it will attract the teacher’s attention. If the other person continues to strike, then you use self defense and only enough to stop the other person to give you time to escape to find a grownup. Every action has a purpose: Master Purcell often reminds the kids that even when they’re not doing anything, they’re doing something. In the context of class, if they’re sitting and waiting and doing “nothing” it means that they should be listening. When they practice kicking paddles, they’re practicing accuracy. When they kick the shield, they’re practicing power. It is one of the highlights of my week to watch Meilee and Shen at tae kwon do. I consider it a happy place, where kids can be kids while working toward a higher goal, learning discipline and respect. Best of all, Meilee and Shen can be in the same class.